Working languages: 11 base languages (Russian, English, French, Italian, German, Spanish, Turkish, Chinese, Japanese, Portuguese, Korean) + 1 additional language (Arabic). Size: 3,897,212 words so far. Team: 39 people, including 22 translators for the base languages, 2 Arabic translators, 1 project manager, 14 editors (11 native speakers + 3 in-house editors for the Russian to English texts). support for the game’s community (answering players’ questions on forums in their language). Megapolis is the number one economic strategy game in over 20 countries. It has over 10 million players and gets over a million hits every day. The game is presented on the social networks VKontakte and Facebook and on the iOS and Android mobile platforms. In 2012, Social Quantum decided to promote its game in 20 countries. The contractor they chose to localize the game was All Correct. Initially, we had three main goals: to completely localize the project, to test the localized versions and to support the game’s community in 11 languages. We had to set up a process for cooperating with the customer in order to optimize our work on the project as much as possible. After the main text was localized, our next task was to support the game’s localized versions and translate its updates and additional marketing materials. The main development language is Russian. The game is translated into the main localization language—English—and then into all the other required languages. The first task we received from the game’s developers was to check the quality of the small amount of game text that had already been localized by another company into English, German, French, Spanish and Brazilian Portuguese. Our review revealed that the quality of the translations was low; it was replete with semantic and grammatical errors along with a formal style unsuitable for video games. First the English text was edited, and then the translations into other languages were edited in accordance with the new English version. After this, the texts began to be localized from scratch into Italian, Chinese, Korean, Japanese, Turkish and Arabic. In order to ensure consistency in the game’s localization into its various different languages, we collaborated with the developers to create a technical specification which included all the main requirements for the translation (the style, target audience, technical peculiarities of tags, usage of the game’s title in the texts and much more). Our translators regularly update it in accordance with current changes in the rules of the target languages. At the same time, the developers introduce corrections in accordance with changes to the gameplay and game mechanics. Over the course of two years, the game’s updates were tested twice a week before each update. native speakers (to validate localization errors). Right now, the customer has stopped testing in connection with the fact that it has been a long time since this stage revealed any errors. This speaks to the high quality of the localization at the translation stage and the well-oiled process of integrating the texts into the game on the customer’s side. Our company also provides support for the game’s community. To increase the localization quality, the client introduced a system for collecting information from players about the presence of localization errors in the game. The players place messages in a special form on the forum (with an attached screenshot) and if the error report turns out to be valid, the player receives a reward in in-game currency. The validity of such messages is checked by the translators once per month. It’s worth noting that the majority of these messages (over 95%) are invalid, and our translators always correct legitimate errors that the players discover in the shortest time. Support for users in their local languages was stopped by the customer after two years of operation. The information collection system is still operational. The game is updated several times per week. The average volume of a single update is 2,000 words for translation and 5,000 words for editing. Updates amounting to less than 500 words are delivered to the customer on the same day as they are received. Updates amounting to more than 500 words are delivered the following day. Practically every day, we receive Russian-language texts of various sizes. These tasks are organized using a program called Redmine. The project manager receives a task accompanied by an attached file, a description of the languages required, and comments from the customer. The manager accepts the task, changing its status. The original files come in the XLSX spreadsheet format with a column for each language. The texts are loaded into memoQ, a professional translation program. This is a CAT (computer-aided translation) program with support for translation memory technology. The translators for the various localization languages translate the texts in this system using translation memories and terminology databases curated for the project in order to ensure consistency in the translated texts. The file is then exported with the translations for all required languages and sent to the developers for integration into the game. The finished file is attached to the original task, its status changes and it is sent to the customer’s employee in charge of localization. The entire team has 24/7 access to our server. The translators and editors begin their work on the project as soon as they receive notification from the project manager. This workflow allows us to ensure consistency in translated terminology — the names of items, in-game areas, achievements, functional buttons and much more. It also gives us the ability to use uniform versions of typical phrases throughout all the game’s updates, which gives players a feeling of consistency. 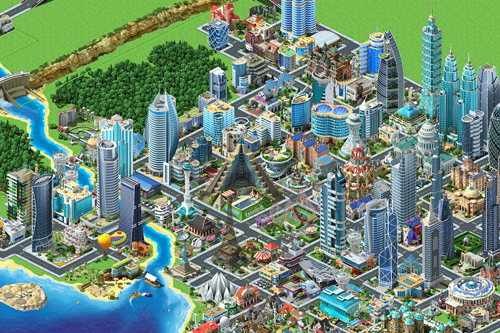 Megapolis is a social game which is widely known on the global market. It is in no small part thanks to its high-quality translation into 10 foreign languages that this city-building game has so many fans. The volume of source text translated by All Correct exceeds 100,000 words. Social Quantum is a company that develops and publishes games for social networks. The company uses unique methods to model the interactive elements in their games and reflect current development tendencies on social networking platforms. The company has launched 7 studios with over 500 employees in the former USSR and Eastern Europe. Social Quantum’s games have an audience of roughly 5 million unique visitors every day and over 50 million registered users. Social Quantum’s games occupy leading positions on Russian and South Korean social networks.